Even as the heat of the sun makes us wonder if summer will ever end, as the saying goes, "Winter is coming." Walking through the farmers markets, I am happy to see a great abundance of tomatoes. With that abundance comes lower prices. Find a farmer who has too much of a good thing and the price comes down even more. "Reduced to sell." "Soft ready to eat." Those are the tomatoes I look for. I'll buy them by the bagful. Five or ten pounds at a time. My plan is to prepare for a time when fresh tomatoes are a thing of the past. I am anticipating a time when storm clouds are outside and I'm staring into the refrigerator looking for inspiration. I yearn for the produce of summer: leafy greens, corn and full-bodied tomatoes. But there is a way to enjoy the sweet-acidic deliciousness of tomatoes even in the darkest days of winter. Just look in your freezer. With abundant tomatoes in the farmers markets, buy ripe tomatoes, roast and freeze them to be used in braises, soups and sauces in the fall and winter. Once blasted with heat in the oven, the tomatoes happily take to the freezer if they are covered in liquid. Enjoy frozen roasted tomatoes whole or puree into sauce, and as rain beats against your windows and snow accumulates on your lawn, you will remember those heady summer flavors. Use ripe and over-ripe tomatoes. 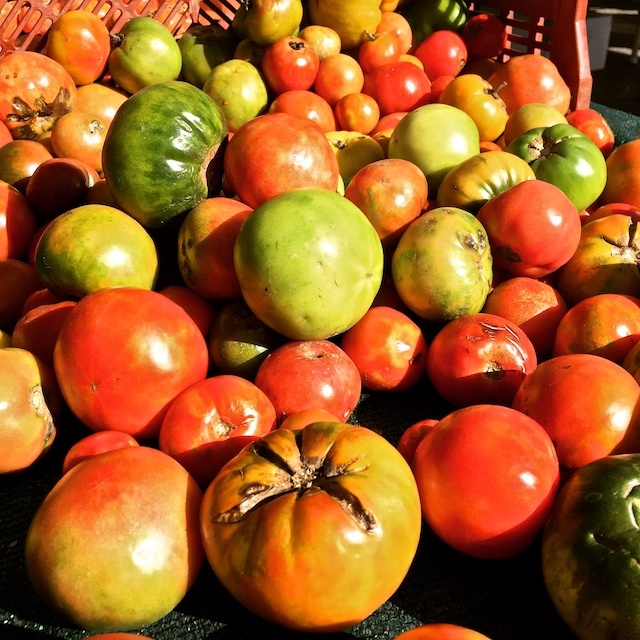 If you can find only unripe, hard tomatoes, leave them in a sunny spot on the kitchen counter until they ripen. Bruised tomatoes are OK as long as you use a sharp paring knife to remove the damaged parts. Avoid tomatoes with broken skin because of the risk of mold. 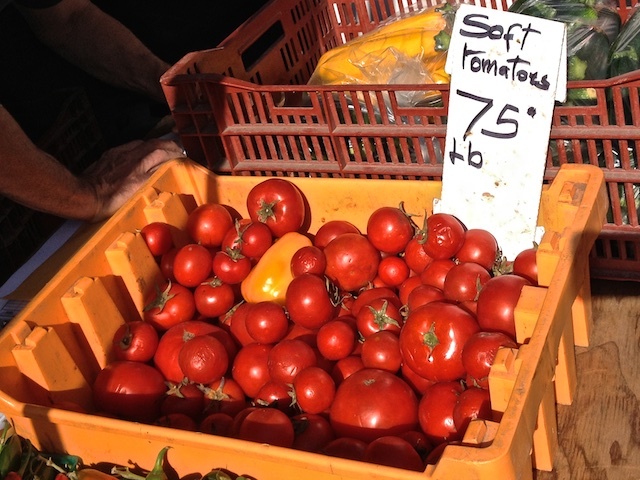 Any kind of tomato can be used: heirloom, Roma, cherry, large or small salad tomatoes. 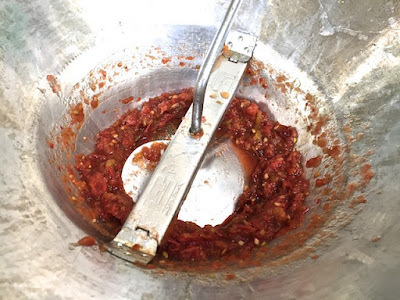 A food mill is helpful when making the sauce. If one is not available, a fine meshed wire strainer will do almost as well. 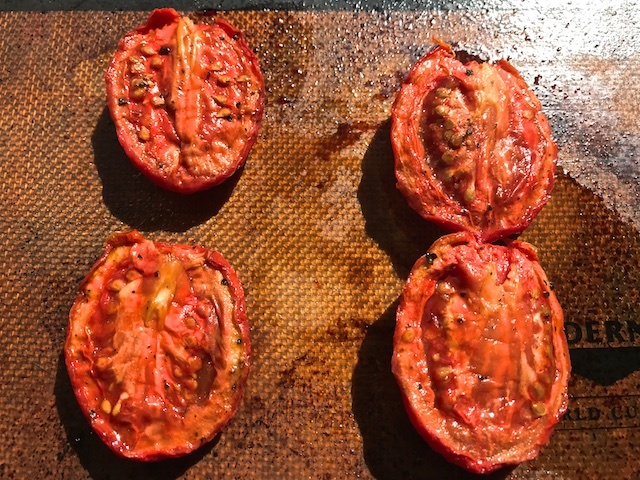 When roasting the tomatoes, it is important to use parchment paper or a nonstick Silpat mat to prevent the tomatoes from sticking to the baking sheet. With a Silpat mat, none of the good bits that caramelize on the bottom are wasted. Tomatoes love the sun’s heat when they’re growing. And they love the oven’s heat that coaxes a rich umami sweetness out of their naturally acidic souls. That sweetness is at the heart of the roasted tomatoes that will be in your freezer. 2. Line a large baking sheet with a Silpat mat or parchment paper cut to size. Use a baking sheet with a 1-inch lip to capture any liquids created during roasting. 3. 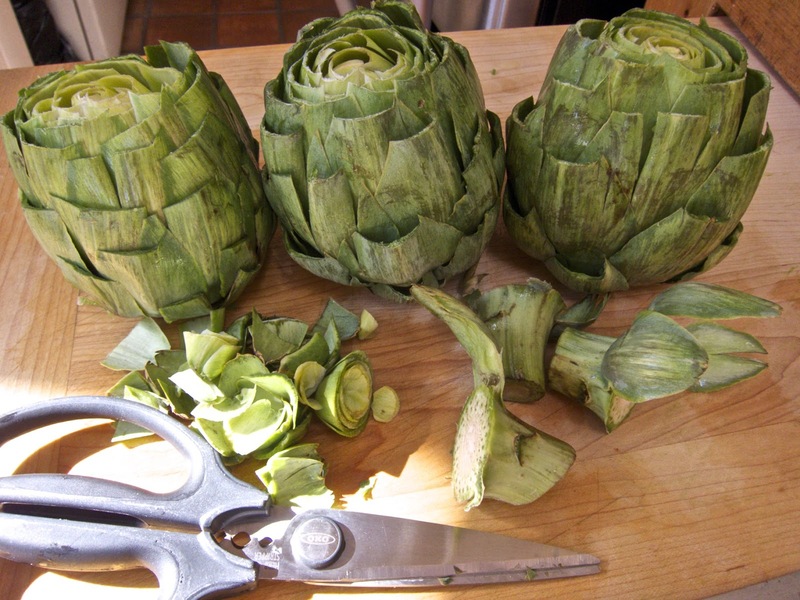 Use a sharp paring knife to cut a “V” shape around the stem, remove and discard. With cherry tomatoes, any stems can be brushed off the surface without making a cut. 4. Place the de-stemmed tomatoes on the lined baking sheet, stem side up. 5. Drizzle with olive oil and season with sea salt and pepper. 6. Place in oven and roast 60 minutes. When you remove the baking sheet from the oven, you’ll notice a clear liquid has accumulated on the bottom. Some of that is olive oil. 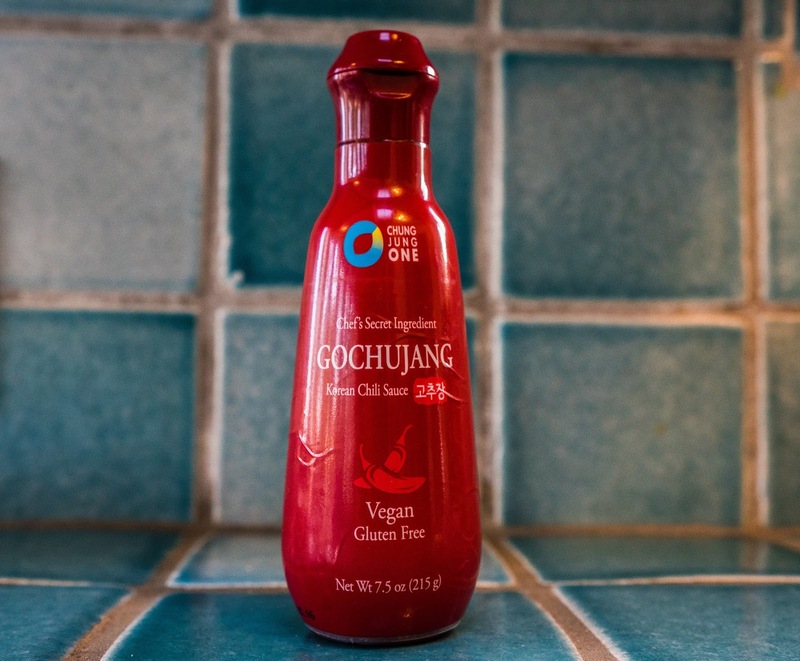 But most of the liquid is a clear tomato essence prized by chefs for its clean flavor. If you are freezing some of the roasted tomatoes whole, use the clear liquid to cover the tomatoes in the deli containers. Use airtight containers that are about the same width as the tomatoes so you will need a small amount of liquid to cover them. When you want to use the tomatoes, take them out of the freezer in the evening and let them defrost overnight. If any ice crystals have accumulated on top of the tomatoes, rinse off the ice before defrosting. If you want to serve them whole, the tomatoes can be warmed in the oven or microwave. They are delicate, so handle them carefully. A deliciously simple pasta sauce to make any time of the year, not just in winter. Serve the pasta with steamed vegetables, a charred steak or a grilled chicken breast and you will have a perfect cold weather meal that warms body and soul. The flavorful tomato sauce can become a vegan dish by simply omitting the butter and cheese. 1. Place a large pot of water on high heat. Add 1 tablespoon sea salt to the water. Bring to a boil. Add the pasta. Stir well every 2 to 3 minutes. 2. Place a heat-proof cup in the sink next to a large strainer. When the pasta is al dente to your taste, about 10 minutes, pour the pasta into the strainer, capturing one cup of the salted pasta water. Reserve. 3. Toss the cooked pasta to prevent clumping. 4. At the same time the pasta is cooking, place a large sauté pan on a medium-high flame. Heat the olive oil. 5. Add the parsley and garlic. Lightly brown. 6. Holding the roasted tomatoes over the sauté pan, use your hands to tear them apart so you capture all the liquid. Add any liquid from the deli container. 7. Stir well and cook until the liquid is reduced by half. 8. Taste and salt, if needed; add a tablespoon or more of the pasta water. 9. Stir well and add butter. Taste and adjust seasoning by adding sea salt and black pepper. 10. When ready to serve, add the cooked pasta to the sauté pan. Over a medium flame, toss the pasta in the sauce to coat. 11. 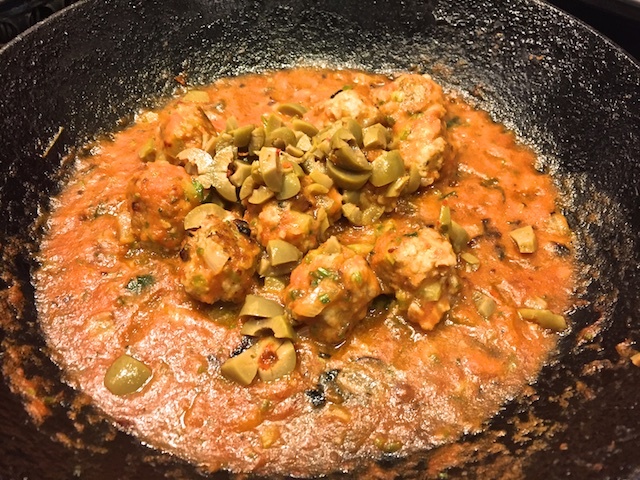 Serve hot with a bowl of Romano or Parmesan cheese. 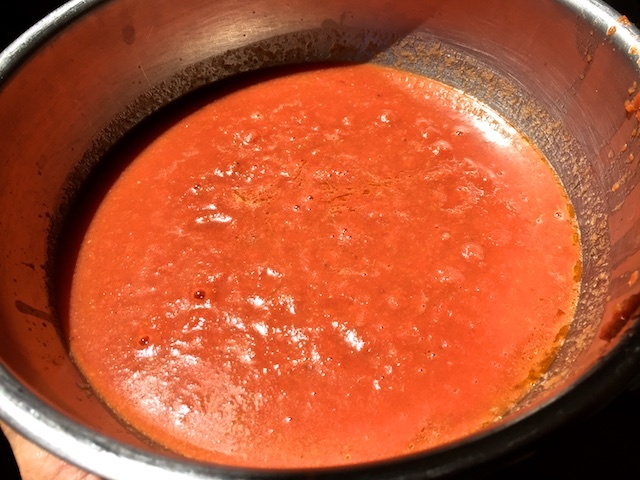 The tomatoes used to make the sauce are prepared and roasted in the same manner as those used to create whole roasted tomatoes. 1. 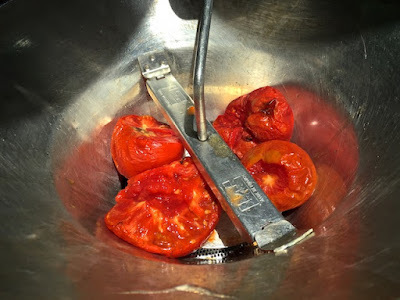 Working with small batches, remove the roasted tomatoes from the baking sheet and put some of the roasted tomatoes into a food mill or fine mesh, wire strainer placed over a nonreactive bowl. Press the tomatoes through, collecting all the juice in the bowl. 2. Use a spatula to scrape off the pulp that will accumulate on the bottom of the food mill or the strainer. Add the pulp to the juice. 3. Discard the tomato skins. Or add to your compost. Or, even better, reserve in the freezer to use with other vegetable scraps to make vegetable stock. Put the open deli containers on a counter. Stir the tomato juice to mix with the pulp. 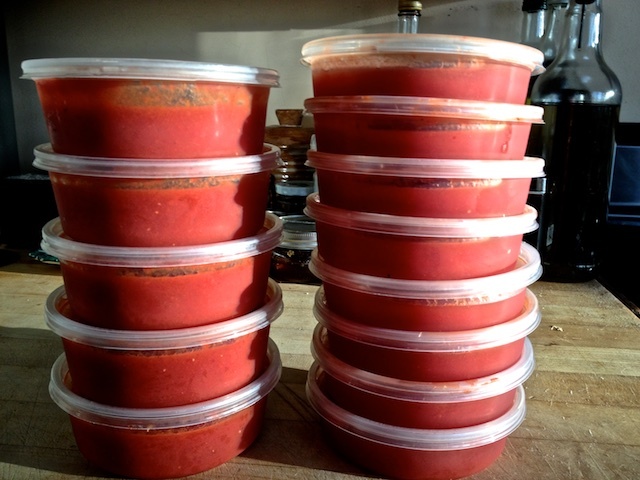 Fill each deli container to a half-inch below the top so that when the sauce freezes, the liquid will have room to expand and will not force open the lid. When cooled, the filled containers can be placed in the freezer. 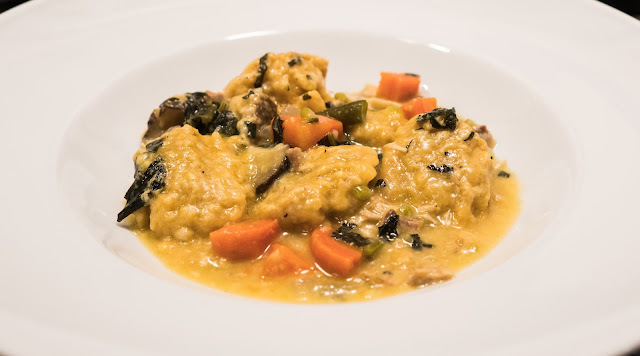 Even without defrosting, the frozen sauce can be used at the last minute, when you want to thicken a soup, add a layer of flavor to a braise or make a simple pasta sauce. There are infinite ways to use this versatile sauce. One of my favorites is an easy-to-make pasta with sautéed vegetables. If any ice crystals accumulate on the top of the sauce, rinse off the ice before defrosting. 2. Place a heat-proof cup in the sink next to a large strainer. When the pasta is al dente to your taste, pour the pasta into the strainer, capturing one cup of the salted pasta water. Reserve. 4. At the same time the pasta is cooking, place a large sauté pan on a medium flame. 5. Heat the olive oil. 6. Add carrots, onion, shiitake mushrooms, broccolini and garlic. Sauté until lightly browned. 7. Add roasted tomato sauce, butter and pepper flakes. Stir well. Taste. If salt is needed, add a tablespoon or more of the pasta water. 8. Simmer on a medium flame and reduce. 9. Taste, adjust seasoning and continue simmering if you want the sauce to be thicker. 10. When the sauce is the consistency you like, add the cooked pasta, coat well. 11. Taste and adjust the seasoning with more sea salt or black pepper. 12. Serve hot with a bowl of grated Parmesan or Romano cheese. A summer heat wave is messing with planet earth. Making an icy-cold batch of watermelon ice cubes will definitely take the edge off the heat. You love summer but not when it is uncomfortably hot. For relief, you could jump into the pool. Or, you could cut a thick slice of watermelon and let the sweet juices cool you down. Even better, you could fill a tall glass with a watermelon cocktail made with watermelon ice cubes and straight-from-the-freezer vodka and settle into the chaise lounge. You stir the ice cubes. Bits of watermelon juice break free. The crystal clear vodka turns pink. 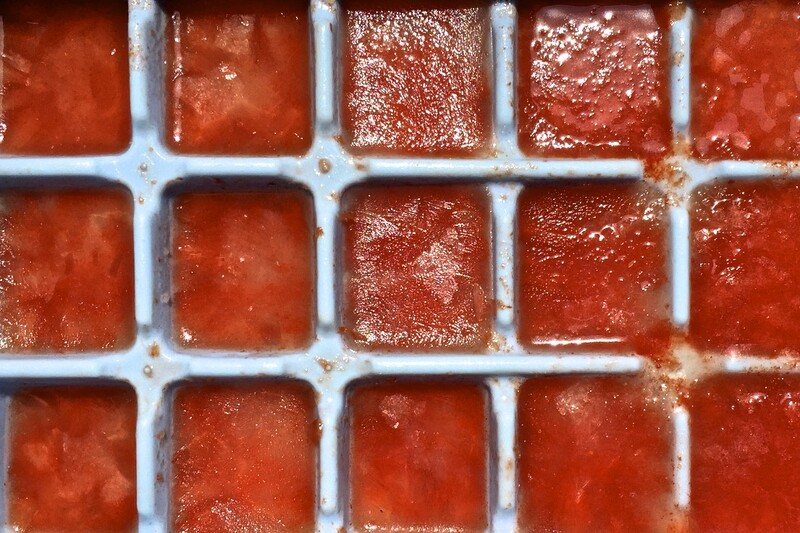 You sip, stir and eat a watermelon ice cube and suddenly you are not overheated any longer. Now, you are cool and happy. The non-alcoholic version is as delicious. Fill a tall glass with watermelon ice cubes and pour in freshly made lemonade. Stir and enjoy. Summer is good for watermelon. They grow quickly in the heat of the sun, producing fat, heavy fruit loaded with sweetness. At the farmers market I was always told to use a hand to thump on the melon. When the sound was deep and resonant, the melon was ripe, ready to eat. If there is a farmer you frequent at your neighborhood market, ask for advice about a good melon that’s ready to eat. Prices for watermelon vary greatly. At Asian and Latin markets, watermelon can sell for as little as 10 cents a pound. 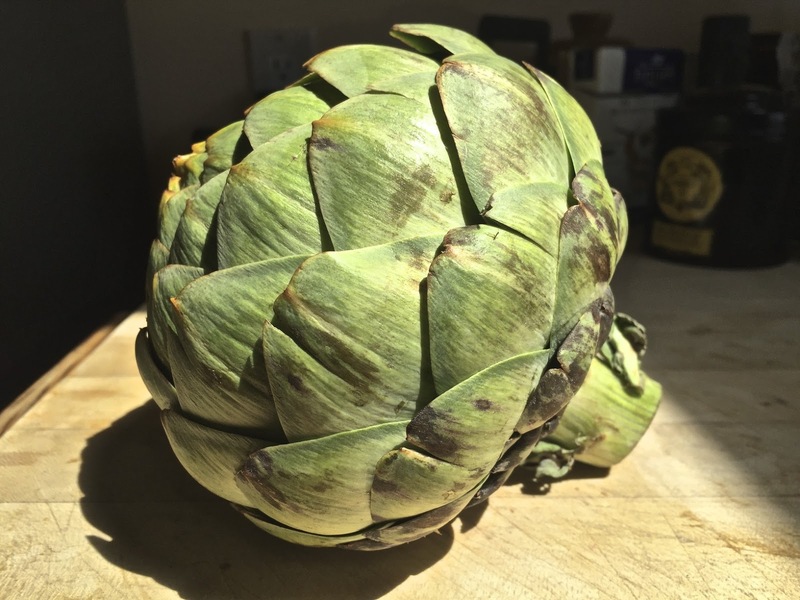 At upscale supermarkets and farmers markets, the prices can be significantly higher. A melon is delicious at room temperature or ice cold. I like to chill the melon overnight in the refrigerator. 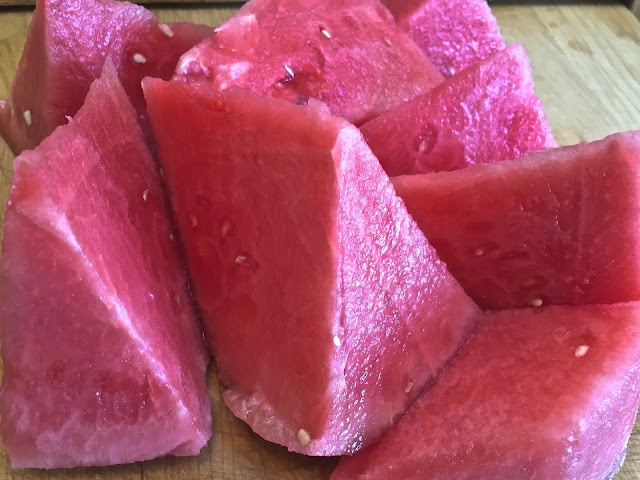 Of course, the easiest way to eat watermelon is to use a sharp knife to cut out a thick slice. But when I was in Zurich recently I met Olivier Rais, a talented chef who runs the bistro Rive Gauche in the iconic hotel Baur au Lac across the street from Lake Geneva. 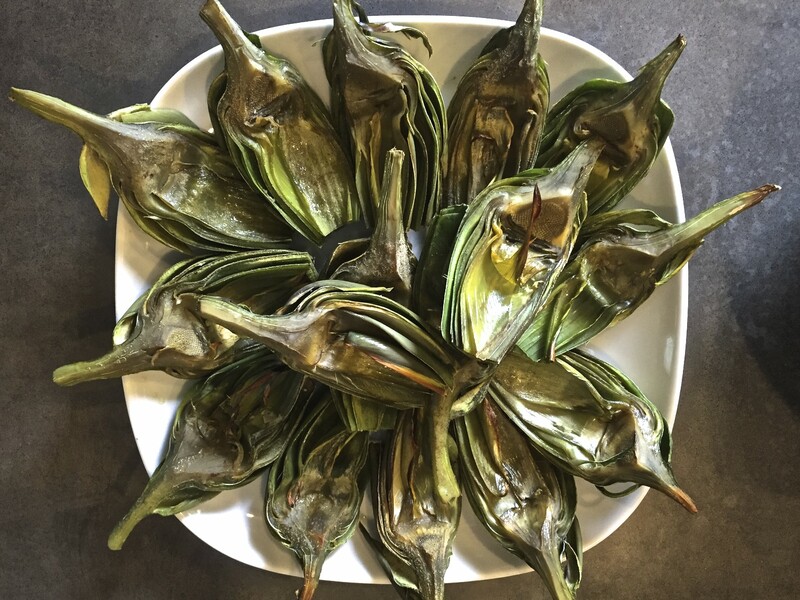 He had just returned from working with Tal Ronnen, the celebrated chef who created Crossroads Kitchen, an upscale Los Angeles restaurant devoted to vegan cuisine. Rais made several vegan dishes for me to taste, one of which was a watermelon-gazpacho served in a glass. I love watermelon but had never thought of extracting the juice. 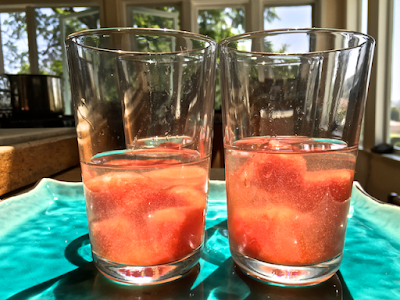 When I replicated his gazpacho at home, I had watermelon juice left over. Deciding to experiment, I reduced the juice in a sauce pan over a low flame. Once the juice cooled, I poured it into a mini-ice cube tray. That night I added the ice cubes to vodka that we keep in the freezer. I dropped in an espresso spoon, settled into a chair and stirred my drink. After a few sips, I realized that I had stumbled onto an easy-to-make, deliciously refreshing cocktail. Summer’s perfect drink. Serve the cocktail with an espresso or small spoon. One of the pleasures of the drink is stirring the ice cubes. 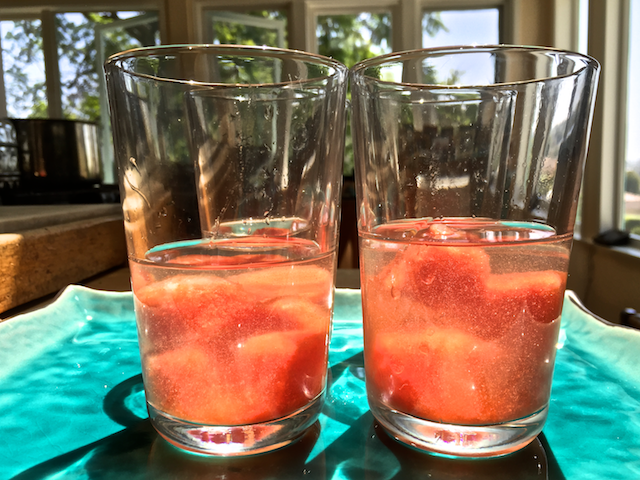 As the ice cubes melt, the watermelon juice infuses the vodka. The mellow sweetness takes the edge off the vodka. As you stir, the ice cubes crater and reduce by half. Use the spoon to scoop up the icy bits. 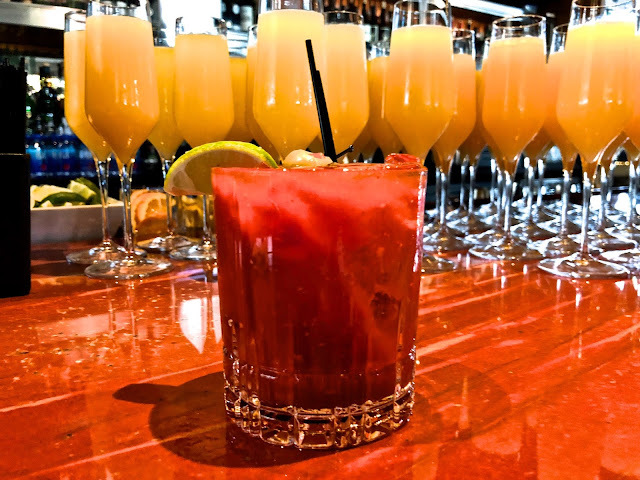 In an effervescent moment, the softened ice cubes dissolve like pop rocks in your mouth. Use any size plastic ice cube tray. The mini-trays that make 1” square ice cubes work well because the ice cubes melt easily. Use only unflavored premium vodka, and for non-alcoholic drinks, add the ice cubes to glasses of carbonated water or lemonade. 1. Place the vodka bottle in the freezer the night before serving. 2. Using a sharp knife, remove the rind from the watermelon. Discard. 3. Cut the melon into chunks, removing any seeds. 4. Place a food mill or a fine mesh strainer over a non-reactive bowl. 5. Press the watermelon chunks through the food mill or strainer, capturing all the juice in the bowl. Discard any pulp and seeds. 6. Pour the juice into a sauce pan over low heat. Reduce volume by 30%. Remove from stove. Allow to cool. 7. Pour the reduced juice into the ice cube tray. 9. Just before serving, pour 1½ ounces ice cold vodka into each glass. Place 5 to 6 ice cubes into each glass. 10. 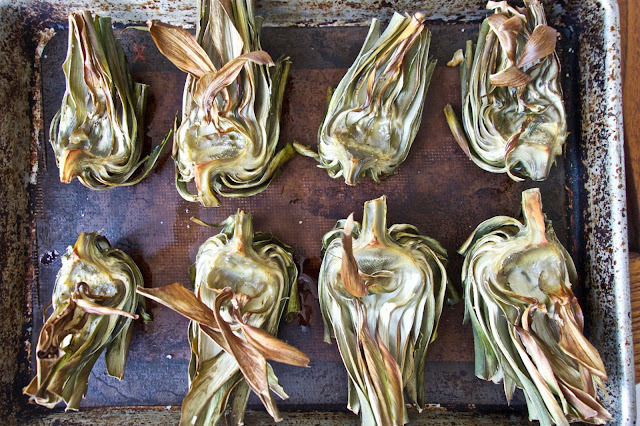 Serve with an espresso or small spoon. I love soup. A cold soup in summer and a hot soup in winter are wonderful comfort foods. The best soups for me are ones that not only nourish but delight with layered flavors. In summer a light and spicy watermelon-gazpacho takes the edge off soggy, sultry days. In cool weather, a satisfying soup of roasted squash is filling and refreshing. With cooler weather approaching, a great many varieties of squash will be available in farmers markets. My favorite is the Japanese squash kabocha. 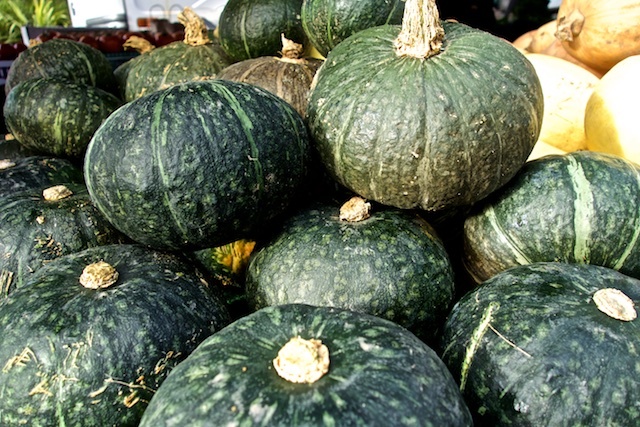 A squat round squash with a flecked dark green outer skin, the flesh can be bright yellow or pumpkin orange. Similar to butternut squash, kabocha is sweeter and cooks more quickly. I first enjoyed kabocha as light and crispy tempura at Yabu, a sushi bar in West Los Angeles. Included in an order was a sheet of seaweed, shrimp, shiso pepper, shiitake mushroom and kabocha. With only one slice of each to an order, my wife and I divided up the sampling but we always shared the sweet flavored kabocha. 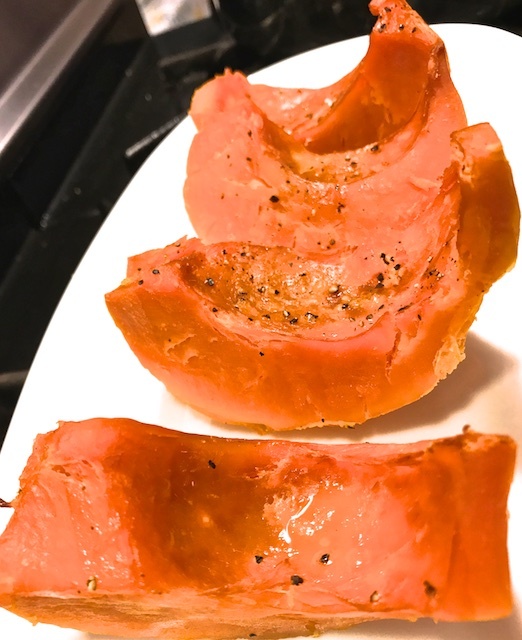 Over the years, I tried preparing kabocha using different techniques. Boiling, steaming, roasting and deep frying. Boiled, the flesh absorbs too much water and becomes soggy. Deep frying is specific to tempura. Steaming softens the flesh. Roasting puts a crust on the outside. I discovered that combining steaming and roasting created full-of-flavor, firm fleshed pieces. We serve steamed & roasted kabocha as a side dish to accompany grilled fish, chicken and meat. 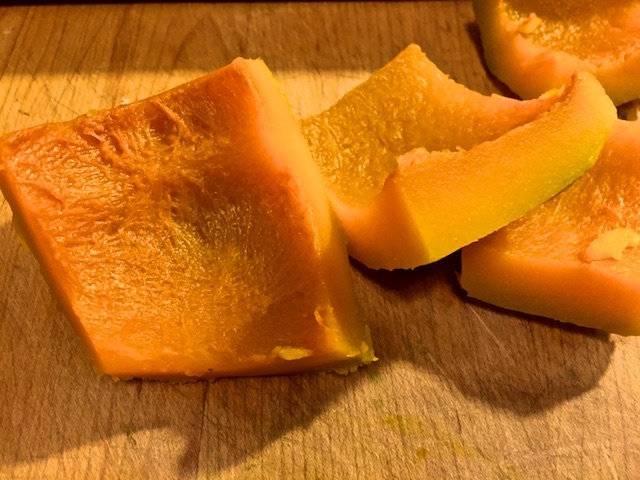 Cut into bite sized pieces, the kabocha is delicious added to soups, stews and braises. Pureed, kabocha creates a deliciously sweet and creamy soup. For a pot-luck brunch at a friend's beach house, I decided to make kabocha soup. Still out of season locally, kabocha can usually be found in Asian, Latin and Persian markets. To make a vegetarian/vegan soup, I used homemade vegetable stock. Homemade chicken stock can also be used because of its light flavor but I wouldn't use beef or seafood stock because they are too strong. 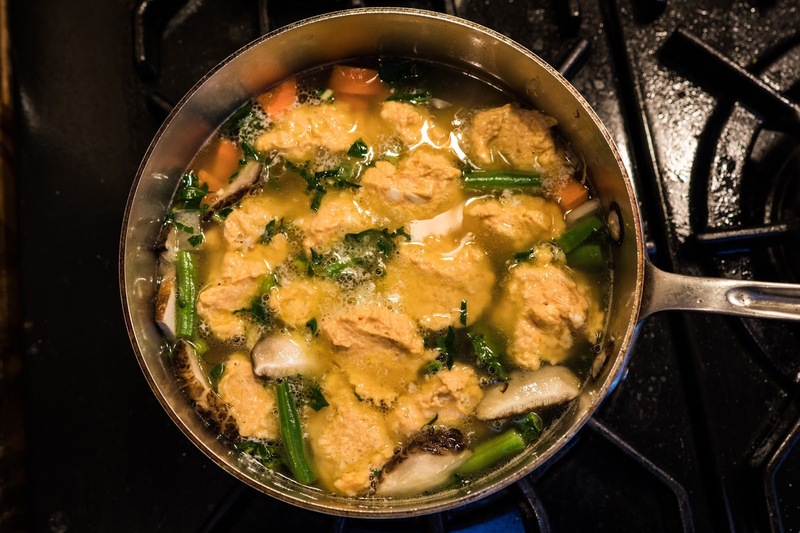 Homemade stock is much preferable to store bought because the flavors will be cleaner and the salt content will be much lower. We always have a good supply of homemade stocks in the freezer so I can make soup at a moment's notice. Making vegetable stock is easy, with a little planning and one important kitchen tool: a food mill. 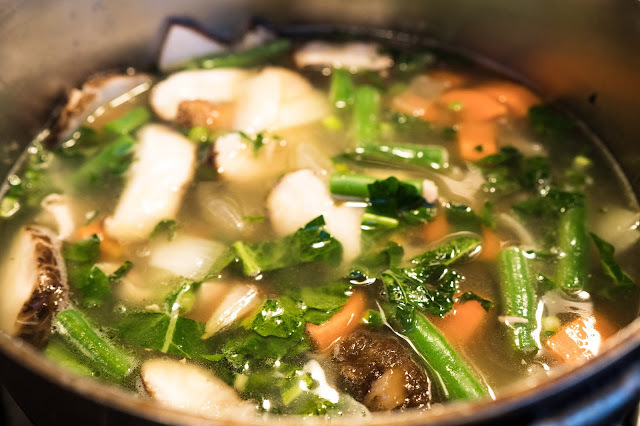 Vegetable stock can be made with a variety of your favorite vegetables. Dice and simmer carrots, celery, onions and mushrooms for an hour with water until soft. Run the liquid and softened vegetables through a food mill to create a delicious stock with pulp, ideal for making soups and sauces. An alternative method is the one I prefer. During the week I collect vegetable trimmings as I prepare salads and stir fries. I place them into a sealed bag in the freezer. When we have corn on the cob, we put the cobs in the freezer as well. Once there is a large amount collected, all the trimmings and cobs go into a large stock pot. I add enough water to cover and simmer uncovered for an hour or more until the stock has flavor. Then the trimmings, except the corn cobs, go into the food mill as described above. I freeze stock in 16 and 8 ounce sealed containers for times when I want to make a soup or a braise. If kabocha is not available, butternut and acorn squash are good substitutes. But they are not as sweet. If shiitake mushrooms are not available, brown and portabella mushrooms are good substitutes. The slow roasted tomatoes are easy to make. While you sleep or read or work around the house, the tomatoes cook in the 225 F oven. Slow roasting removes the tomato's water, concentrating the flavors, bringing out sweetness. 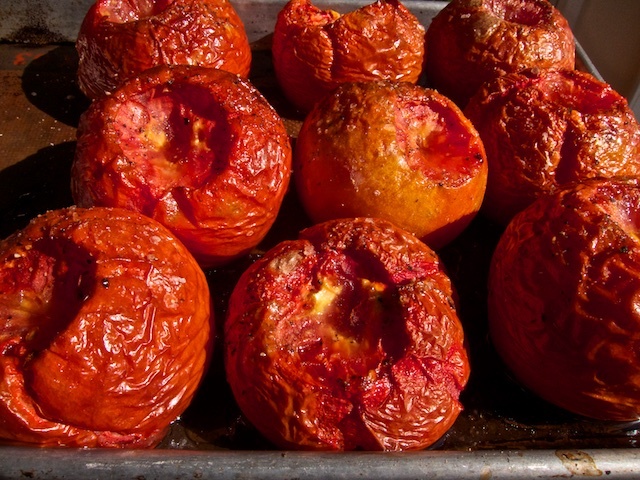 After the tomatoes are removed from the oven and cooled, they can be refrigerated or frozen in an air tight container. Remove the paper thin skins before using. The skins aren't edible but they add a wonderful flavor to vegetable stock. 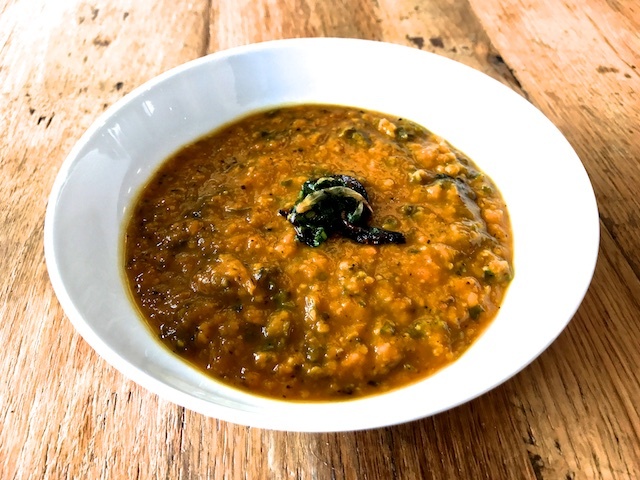 To puree the soup and create a creamy texture, use an immersion blender or a blender. I like the immersion blender because of the easy clean up. When blending, no need to remove all small vegetable bits. A bit of texture is good. As a topping, homemade croutons or charred greens (escarole, spinach or kale) and onions are good. 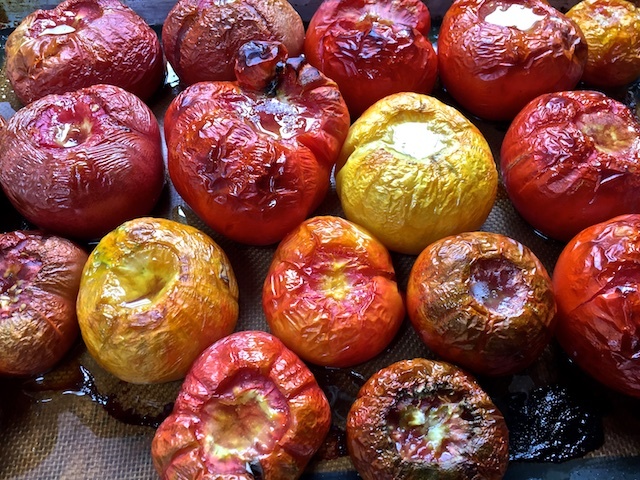 Before you go to bed or while you are working around the house, preheat the oven to 225 F. Place the halved Roma tomatoes on a Silpat or parchment sheet on a baking sheet. Drizzle with olive oil. Place in the oven 5-6 hours. Remove when the tomatoes are still plump and they have reduced their size by half. Remove tomatoes and allow to cool. 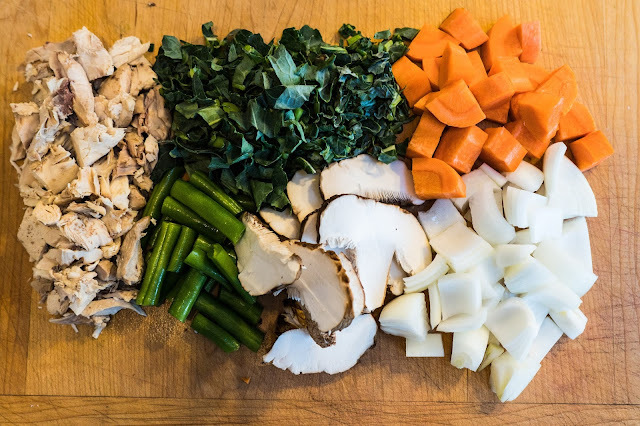 If using immediately, remove the skins and discard or use to make vegetable stock. Finely chop the roasted flesh and reserve. Place 2" water and kosher salt into the bottom of a large pot. Place a steamer basket into the pot with the quartered kabocha on top. Cover. Bring water to boil. Cook 10 minutes or until a pairing knife can be easily inserted into the flesh. Remove and cool. Using a pairing knife, remove the kabocha skins and discard. Place the steamed kabocha on the Silpat or parchment sheet covered baking sheet. Drizzle with olive oil. Place into preheated 350 F oven. Cook 30 minutes. Remove and allow to cool. Heat a tablespoon olive oil in a large pot. Sauté but not do not brown mushrooms, medium onion slices and kale. Cut roasted kabocha into quarter sized pieces and place into the pot. Add stock. Stir and simmer 30 minutes. Heat a teaspoon olive oil in a small frying pan. Saute the sliced small onion and chopped escarole, spinach or kale until charred. Remove and reserve. Taste soup. Adjust seasoning with sea salt and/or black pepper. Taste and add cayenne (optional). 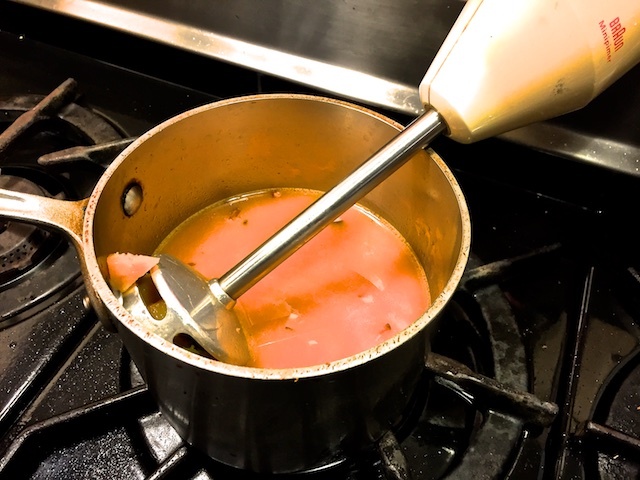 Using an immersion blender or blender, puree soup until smooth allowing for some vegetable bits. 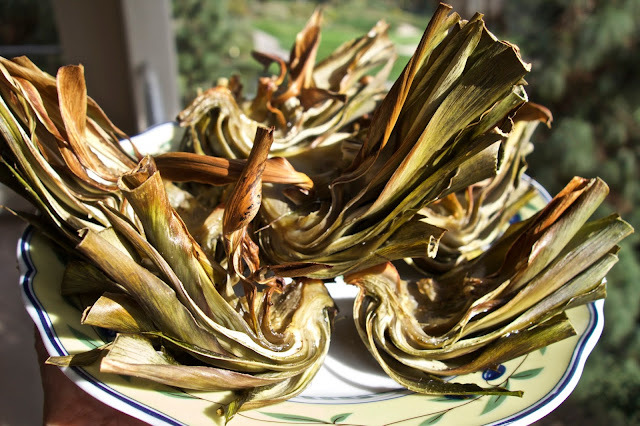 Serve hot with the charred escarole and onions sprinkled on top. You love summer but not when it is uncomfortably hot. For relief, you could jump into the pool. Or, you could cut a thick slice of watermelon and let the sweet juices cool you down. Even better, you could fill a tall glass with a watermelon cocktail made with watermelon ice cubes and straight-from-the-freezer vodka and settle into the chaise lounge. You stir the ice cubes. Bits of watermelon juice break free. The crystal clear vodka turns pink. You sip, stir and eat a watermelon ice cube and suddenly you are not overheated any longer. Now, you are cool and happy.